Some spaces, however, call for a more compact profile than offered by a gooseneck mount. The Original™ Wall Sconce offers all of the style and customizing options of the Original™ Gooseneck but with a wall-hugging mount. 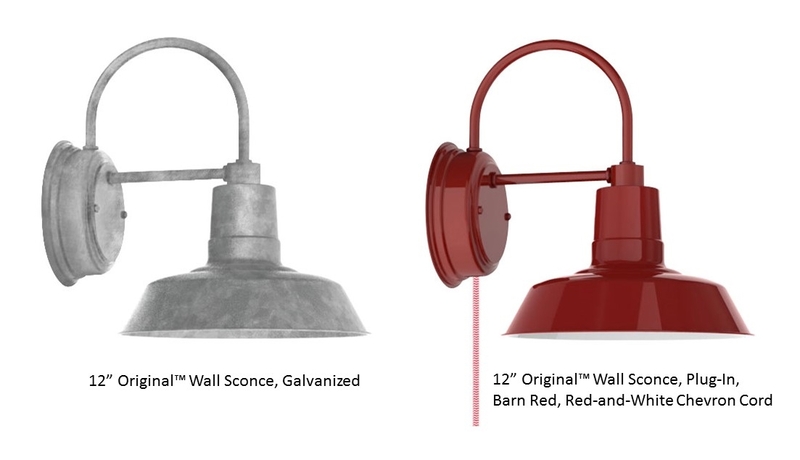 The Original™ Wall Sconce features the same warehouse shade as the gooseneck but is affixed with two arms to a sturdy backing plate. As shown above, it can be hardwired or customized with a plug-in option which is great for portability. 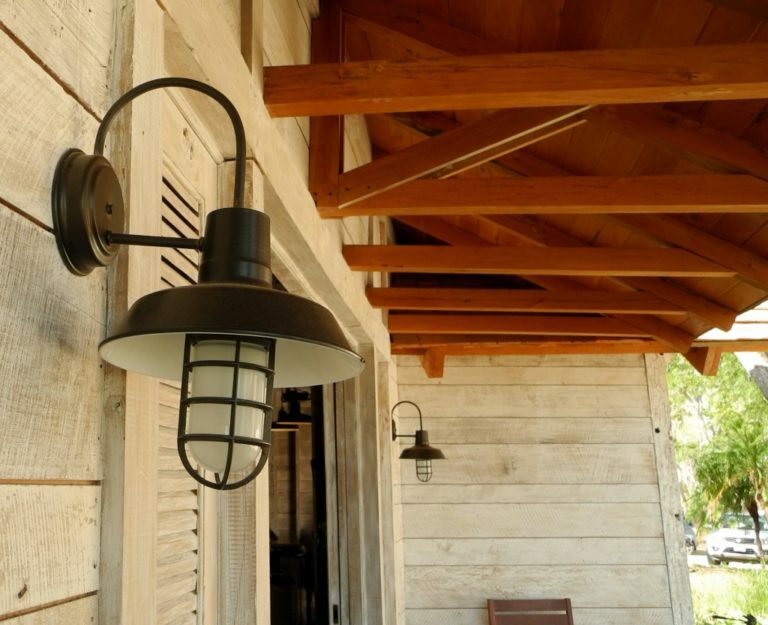 When Tony and his wife updated the exterior lighting on their Georgia home, they searched for high-quality lighting with a slightly industrial yet elegant look. 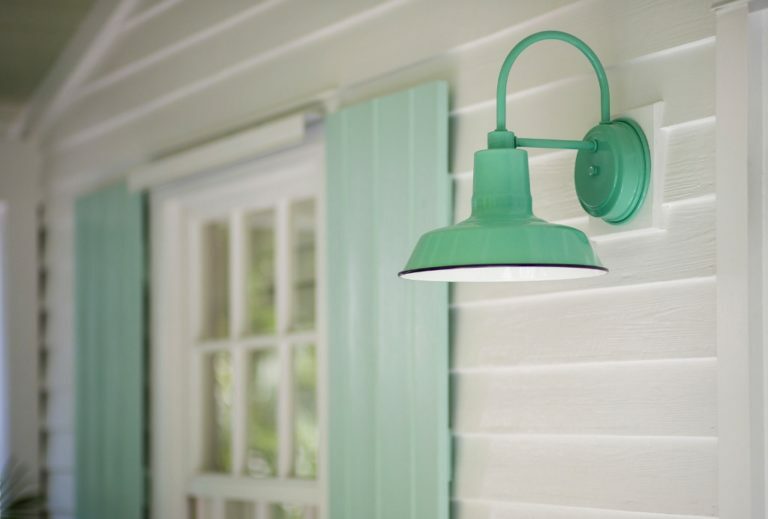 The couple scored on all three fronts with Original™ Wall Sconces for their garage. 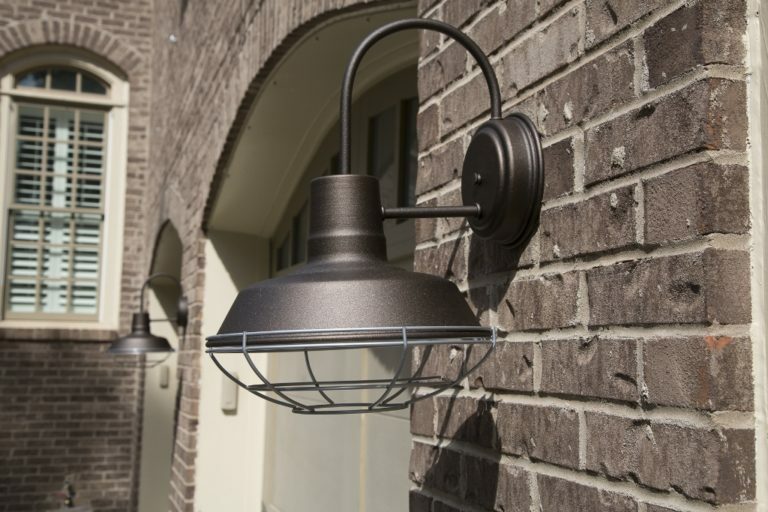 These handcrafted 12″ shades feature a wire cage for some industrial flair and the Oil-Rubbed Bronze finish offers an upscale touch. At Rancho Santana, a five-star resort located on the Pacific coast of Nicaragua, the same 12″ Original™ Wall Sconces in Oil-Rubbed Bronze are adorned with a cast guard-and-glass option for a hint of nautical style. With an overall projection of just more than 14 inches, these wall lights offer illumination without hindering the flow of foot traffic. Our Original™ Wall Sconces played a starring role in the premiere episode of The Bakery Boss on TLC a few years back. 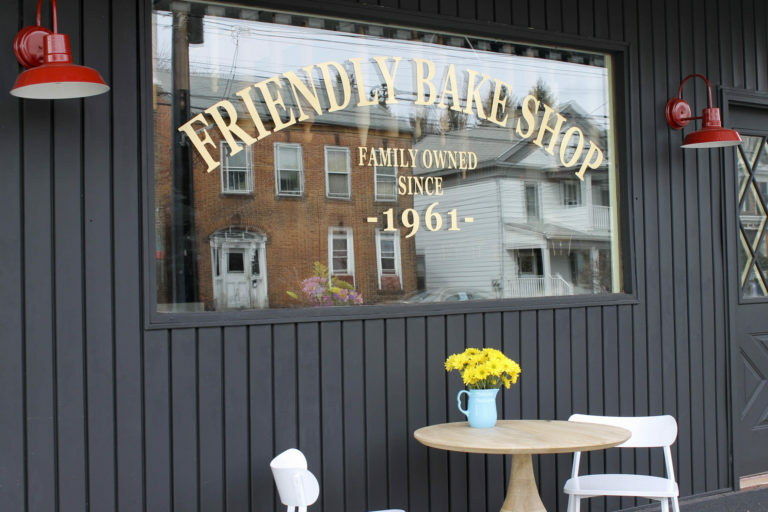 The Friendly Bake Shop, located in New York, was transformed under the talented hands of designers Kim Lewis and Jowill Leano who chose our handcrafted wall sconces in Barn Red to highlight the exterior. 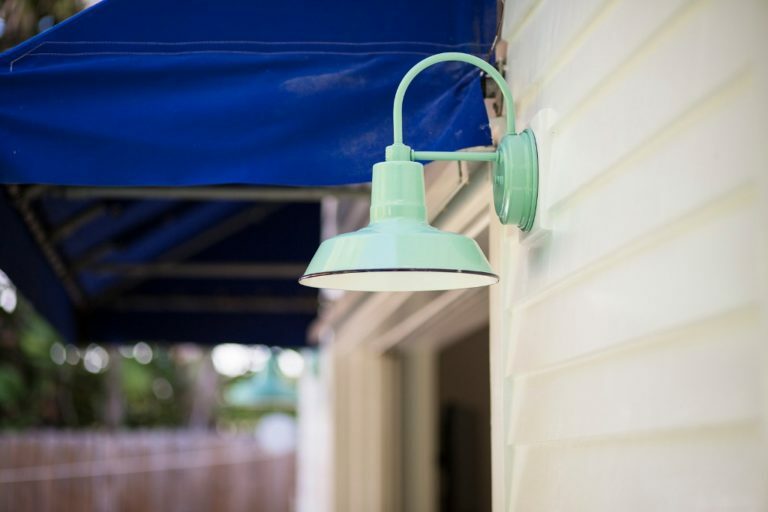 These 12″ shades frame the front window beautifully and provide lighting to the sidewalk cafe seating. For those who love the look of the Original™ but prefer the high-gloss finish of porcelain enamel, this shade is also available as the Wheeler™ Sky Chief Wall Sconce. Handcrafted from commercial grade steel, this version is finished with multiple layers of porcelain enamel glass. Each shade is fired in our porcelain oven which creates its signature high-gloss finish that will never fade. This gorgeous Jadite wall sconce was featured in this post and the destination is definitely on our bucket list! 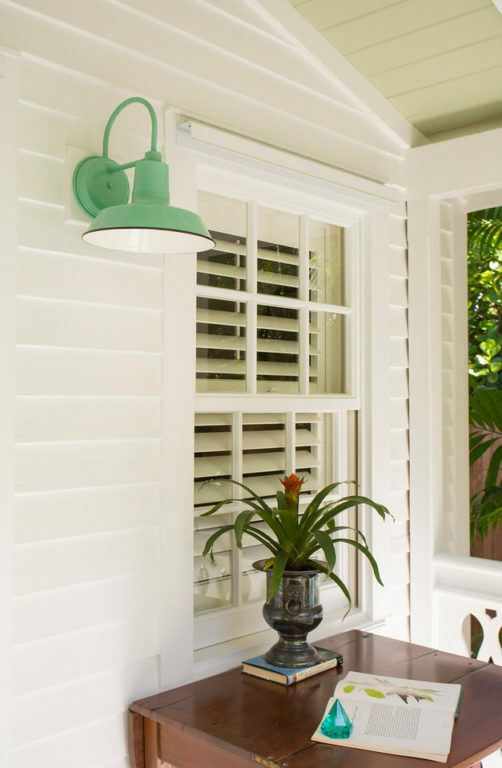 What could be better than a sun-drenched porch in Key West filled with tropical flowers and porcelain enamel lighting?! Whether you choose the Original™ or its twin cousin the Wheeler™ Sky Chief, you can be assured that your lighting is spun from the highest quality metals we can source and hand finished by our talented team of artisans. With dozens of finish colors to choose from ranging from traditional Black, White, and Galvanized to more contemporary hues of Buttery Yellow, Royal Blue, and Teal, these American-made wall sconces are crafted to last. And for those looking for greener options, both the Original™ Wall Sconce and the Wheeler™ Sky Chief come in energy-efficient, environmentally friendly LED!